Happy Friday lovelies! Current cold weather weirdness aside, spring is here, which means that we are breaking out pretty spring clothes and baring more skin. Now is the time to extend your skincare routine to your entire body (if you haven’t already) to get glowing, healthy skin all over. 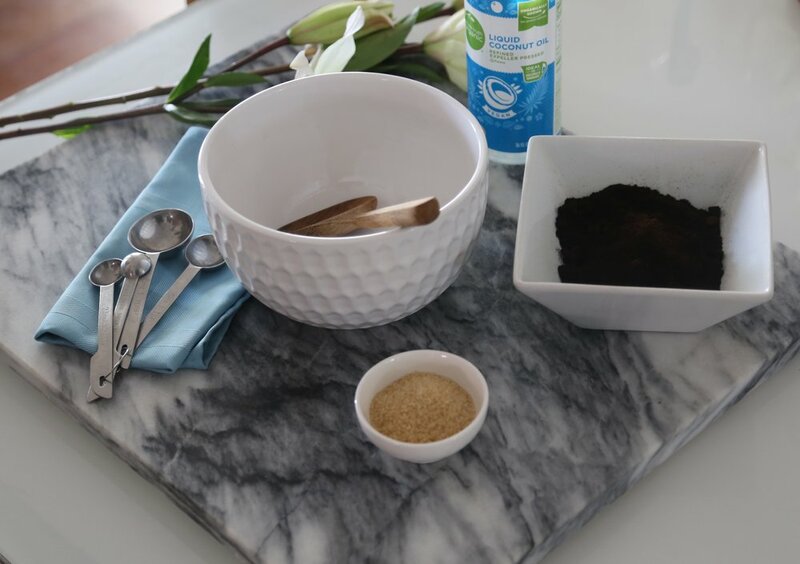 With that in mind, I decided to share one of my favorite DIY recipes with you all, a Beach Body Scrub made with coffee grounds. I love this scrub because it leaves you feeling silky smooth. It’s great for coming out of your long-sleeves-and-jeans hibernation with confidence. The coarse texture polishes away dry skin cells to reveal beautiful new skin while the coconut oil locks in moisture and gives a little shine. Most importantly, the caffeine from the coffee grounds minimizes the appearance of cellulite and inflammation. Maybe it’s just me, but I also think the faint coffee smell that stays with you is delicious. I always use simple ingredients found in nature in my beauty products. Simple is often better! And natural ingredients are always better for you and the planet. This recipe takes sustainability to the next level by using recycled coffee grounds as the main ingredient. What makes this recipe even better? It’s incredibly easy and you probably already have all the ingredients you need to make it. I’m here to show you that you have some magic right in your kitchen for a wicked skin hack! I recommend saving and drying your coffee grounds (instructions below) after your morning cup o’ joe. Don’t drink coffee? Me neither, but no worries. Coffee shops are usually glad to give away brewed coffee grounds to customers. You can use coffee grounds in compost for thriving plants and trees, but just be sure to put aside a cup or two for this yummy scrub! Slowly add in your oil, mixing carefully. Store your magical scrub in a jar or tin with a lid (no plastic if possible). Keep dry. Spread wet grounds on lined baking sheet. Grounds should be dried out no more than 1 day later. Bake for approximately 60 minutes or until dry. Your house will thank you for baking these grounds. It gives off a very refreshing, clean aroma. Following your last rinse in the shower, take at least 1 tsp of scrub and gently massage it all over your arms, legs, thighs, tummy and shoulders. You may use as much scrub as you want. Rinse well after a thorough application. Enjoy this scrub on a morning before you hit the beach or any outside activity where you are exposing areas with cellulite. Your skin will appear tight, right and glowing for adoration and picture taking. I hope you all get to make and enjoy this scrub over the weekend. Let me know what you think about it and how it worked for you in the comments on my Instagram @leelasbodycocktails. Why the Beauty Industry Is Buzzing!